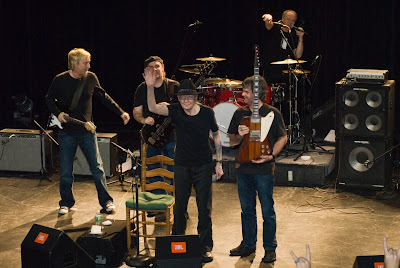 When the eating is over: The Friday-night party will be happening in Red Bank, New Jersey, where our friend Joe DeJessa has assembled yet another killer bill at the fabled Count Basie Theater: Johnny, Rick Derringer and guitar-slinger J.B. Kline. Click here for ticket information. Show time is 7:30 p.m. Be there! Crossroads on PBS: If you missed all the excitement of Eric Clapton's Crossroads Guitar Festival, undeniably one of 2007's most unforgettable rock events, be sure to tune in to your local PBS station for broadcast times. And look for Johnny with the Derek Trucks Band, as well as during the show's finale! As of this post, the first broadcast is slated for November 28 by New York's WNET (Channel 13). Johnny in Modern Guitars: Interview here! Around the Web: Click here for shots of Johnny in action at Savannah, Georgia. From the road: Johnny rocked the Inter-Media Art Center in Huntington, New York, on Saturday night (11/3), and now gets to enjoy a few days off before picking things up on Wednesday at the North Theatre in Danville, Virginia. Johnny will then hit the Handlebar in Greenville, South Carolina (11/8); Smith’s Olde Bar in Atlanta (11/9); the Roundhouse Blues & BBQ Festival in Savannah, Georgia (11/10); and The Pour House in Charleston, South Carolina (11/11). Above Huntington photo courtesy of our friend Neil Calandra. (Thanks, Neil!) And for more of Johnny’s upcoming tour dates, click here. Crossroads DVD: Readers of this space know that Johnny had a blast in late July when he took the stage at Eric Clapton’s Crossroads Guitar Festival in suburban Chicago, delivering a scorching reading of “Highway 61 Revisited” alongside the Derek Trucks Band. That performance, as well as Johnny’s participation in the all-star jam finale, can be found on Crossroads Guitar Festival 2007 from Chicago, due November 20 from Rhino. Got live blues? Two of Johnny’s recent releases have recently gained some traction on the Billboard Blues Chart. Of course, we’re talking about the new Live Bootleg Series, Vol. I, which finds Johnny opening up his personal vaults for the first time ever, and Breakin’ It Up, Breakin’ It Down, which captures Johnny on stage in the late 1970s with blues icons Muddy Waters and James Cotton. Around the Web: We’re always interested to see shots of Johnny in cyberspace. Recent samplings can be found here, here and here. And for some really incredible shots of a 25-year-old Johnny (taken in 1969), click here.